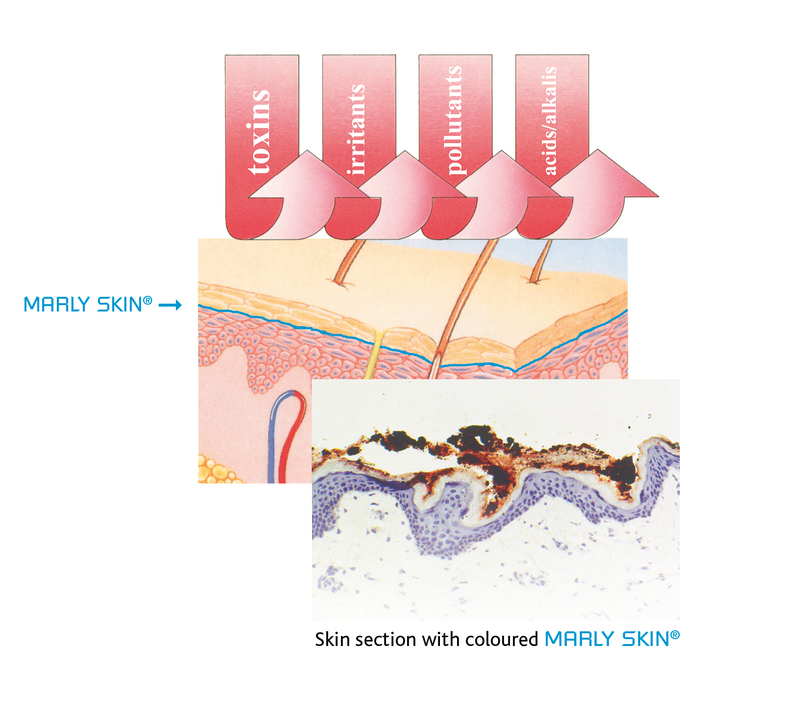 Marly Skin® realizes a unique skin protection principle! After applying the Marly Skin®-foam, a two-dimensional network is formed IN the skin. There is thus no abrasion (such as creams and ointments). This results in a highly effective skin protection for a period of more than 4 hours, not only on the hands, but also on the whole body, even in the face. Marly Skin® effectively protects the skin from alkaline and acid solutions, organic solvents and dust, aggressive cleansers and disinfectants, bodily fluids, lubricants, paints, inks und dyes, allergens, chemicals and other toxins. Prevents problems from frequent cleansing, when wearing gloves and from incontinence. BENEFITS: Skin maintains a natural moisture balance. It is nontoxic and non-greasy, no occlusion, pseudo-occlusion, no change to normal skin functions or sense of touch, skin breathes and perspires normally, the protection does not wash off and remains reliably over 4 hours. And safe to use when handling food.